Warmer water holds less oxygen, adding to the problem from runoff, but warmer water also affects dead zones by keeping the water more separate, so that oxygen-poor deep water mixes less. 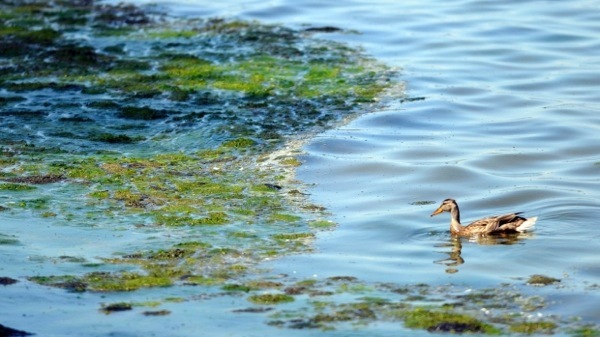 A duck swims in Lake Michigan’s Green Bay near an accumulation of algae. The bay is one of the many bodies of water that have developed dead zones, areas where fertilizer and wastewater runoff has created excessive levels of nutrients that build up microbes but deprive marine life of oxygen.